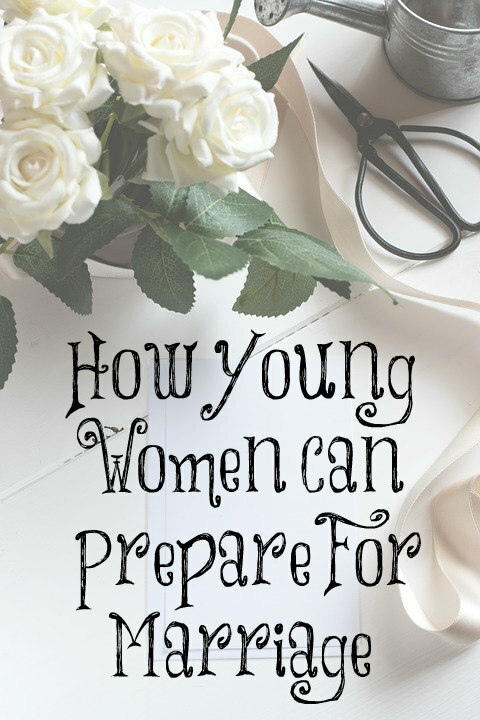 How can young women prepare for marriage? It’s not easy in our culture today since public schooling and colleges sure don’t prepare young women for this. Most churches don’t even prepare young women for marriage. Many mothers haven’t been taught how to be godly wives so they have no clue how to prepare their daughters for marriage. So how can young women prepare for marriage? Here are some suggestions from women in the chat room. “I was pushed towards college but in my heart I knew I wanted to be a wife. I was the girl at my desk in food and nutrition class (which was presented as ‘when you work in the food industry’ not ‘when you prepare food for your family’) copying recipes from the back of the book to save for a future husband. Other practical things that you can do, build a skill base and practice, and honestly, it sounds old-fashioned, but start a hope chest. “Knowing what I know now, I would have spent more time helping moms I knew with their kids, and sought out friendships with women a little further along in life than I was. I also would have properly vetted the company I kept, and made better use of my time when I was younger. All the time I spent hiking, biking, and exploring was fun, but if I had spent more time building on the skills I need now, I’d be better at the work I am doing currently and it would be better for our family. “Not that my life was all fun and games. I worked a lot. In that regard, I would have sought out work that was either business based or human development type in education; it would transfer well to helping a husband with his own business or raising kids. The most important thing young women can do is to grow in the wisdom and the knowledge of the LORD. 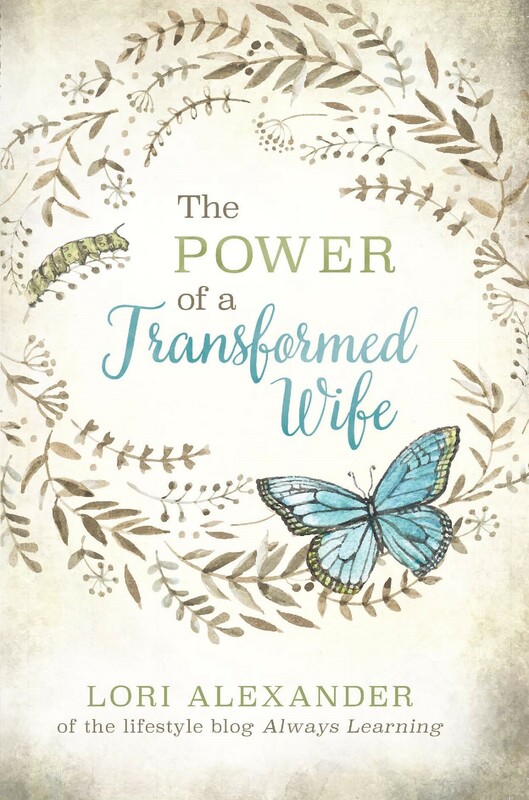 Allow Him to transform you into a godly, feminine woman. Practice acting feminine. Don’t allow feminist thought to dictate your behavior. Learn how to control your tongue, emotions, and feelings. Don’t allow them to control you. This will be a huge asset to a future husband! Determine to not argue with people anymore so you won’t argue with your husband. (Don’t be a quarrelsome wife!) Learn about modesty and what dressing modestly looks like. Vow to be chaste until marriage. Set boundaries up before you begin to meet godly men so as not to defile your future marriage bed. Discipline yourself for the purposes of godliness and learn contentment. Study nutrition and learn how to keep your family healthy. Pray daily for your future husband and that your marriage will glorify the LORD and bring honor to Him. I’m remaining pure for my future husband and act and dress modestly. So many young women and girls are being brainwashed by feminism to be vulgar and promiscuous instead of lady like and chaste. Also teaching girls to value traditional womanhood will attract the right man. Marriage also needs to be put back in it’s rightful place in society, instead of degraded into dating 2.0! I think that a young chaste woman is thought of highly. I am currently teaching my 2 daughters just how important these things are. I went to my wedding night that way and I have no regrets! It’s God’s plan and it is RIGHT! Hey Lori would you explain whats wrong with vegan food. I make vegan food 80 percent of the time and my husband and daughter really enjoy it. Most men love their meat! I think there is a big difference between vegan and 80% vegan. For two years my doctor put me on a strict vegan diet (with other major restrictions as well). It was hard making different meals for everyone each night because of severe allergies in the family as well. But my family didn’t mind eating quite a lot of the vegan food. I just needed to throw some meat/eggs or fish in every once in awhile. It also suggests that a woman is high-maintenance and subject to fads. That may not actually be the case, but unless she explains herself, a lot of men are going to be running for the tall grass. Watching one excruciating exchange between your date and a waiter while she orders her meal with surgical precision can turn beauty into a potential life-long nightmare faster than Krispy Kreme ever dreamed possible. Can you do a post explaining more about what is a hope chest and how to make/prepare one? This is the first time I heard of it. I will like some ideas preparing one for my daughter. Thanks. All I know is that it is things that young women save up for their marriage – treasured things that they want to use once they’re married. Maybe some other women can expound upon it since this is all I know about it! I am not a woman but a husband who benefited by a wife who had what would be considered a hope chest. She got most of the items quite reasonably while in highschool and college. She had a complete set of dishes for 8 (plates, side plates, two sizes of bowls plus a few serving bowls), silverware for 12 (forks, knives, and spoons), napkins and table cloth, etc. I came in – through inheriting – with a good set of stainless steel pots and pans (better than the Teflon coated ones she had). SHe had gotten many things from the grocery store when they used to have the buy so much and get plates and utensils. She also made some items as part of her learning to sew and crochet. The concept of the hope chest is basically the items to set up your household for cooking and cleaning. A young woman should start this at age 13 or so. For a man it would be the tool chest he should be building up starting at age 13 or so as he learns to work on his bike and the lawn mower then working up to helping his dad with the car. These may not be the best tools or cooking items but they can be gotten at garage sales, sealed shops, flea markets, etc. Then as time goes on the man and the woman could buy better and give their old to their children. These can all be found on Amazon.com for a few dollars used. Great for daughters preparing to be homemakers! Mother had a hope chest made by Lane, a company known for their cedar-lined wood chests that came with a lock and key. Mother’s was a gift from her mother, I suppose, and she filled it with items she would someday take into her marriage (to my father in 1959). When I was 16 in 1977, I got my first job at Dairy Queen. Believe it or not, I had read in a magazine for teenagers a list of items every wise girl puts in her hope chest! Believe me, it’s highly unlikely that a list like that is in any teenager magazine today! There was a list of kitchen items (I still have the set of spoons/knives/forks I bought! ), bathroom items and bedroom items. With every Dairy Queen paycheck, I would purchase another item on the list (measuring cups, or spoons, or face cloths, pillowcases, etc.). Oh! Those were fun times! A few years ago I followed a blog by a mother who was preparing beautiful handmade items as additions to her daughter’s hope chest. I’m going to see if I can find that! I enjoyed reading and seeing all her beautiful work. One of the few things that my own girls took into their marriages was two baby blankets, each trimmed in crochet by Sis. Temple Morton. I had been given Sis. Morton blankets when my babies were born, and our girls wanted Sis. Morton blankets for their babies, too. Something to think about as you plan your daughter’s hope chest. Our older daughter has Eloise, 1, and our younger daughter is expecting Pemberley any day now. This was great Lori! I think it is So important to raise our daughters to value Biblical womanhood. There is just too much worldly garbage out there that is poisoning the minds of young girls and women. These are so helpful! One thing that has been MAJORLY helpful in my journey towards femininity and marriage is “Fascinating Womanhood” by Helen Andelen. The book is so full of amazing wisdom. It was first written in the 60’s. Also side note on veganism/vegetarianism. PLEASE do your research before you go on that diet. I did it and it really hindered my health. Vegetables are a great CLEANSE for your body but they do not nourish it. They are not bio available. Meat, eggs, and dairy are the only proteins our body can use to build on. If you’re interest Dr. Natasha Campbell has amazing explanations on this topic. Thank you, Nicole. I do want to warn the women that Fascinating Womanhood is written by a Mormon woman. I must prefer Created to Be His Help Meet by Debi Pearl or better yet, Preparing to Be His Help Meet for those who want to be married. I don’t believe vegetarianism is healthy either. Jesus fed His disciples fish and God gave man the animals to eat. Thank you for replying Lori. I am aware that Ms. Andelen was a Mormon lady. I prayed that God would help me discern anything that wasn’t biblical. Like the wise old cow, eat the grass and spit out the sticks. I will for sure check out the other books you recommended! Thank you Lori for warning on both of these things as I have learned the hard way from both being on a vegan then vegetarian diet for many years and also getting involved in Fascinating Womanhood groups. Both are not fully Christian and therefore we need to be cautious. Agreed, Lori—my parents have followed a strict vegetarian diet (no meat, fish, or eggs) for the past 40 years as part of misguided spiritual beliefs and my mom’s health suffers greatly—including a serious B12 deficiency (if you don’t get enough B12 your brain basically turns to mush)…definitely not a diet God designed our bodies for! Regarding vegetarianism…God did not give man antibiotic, hormone infused meat to eat; Jesus did not feed His followers mercury laden fish. Vegetarianism..actually, veganism using organic plant foods is an extremely healthy way to eat. However, it’s easy to remove a portion of an entree, then add fish or meat for family members who aren’t vegan. This is what God has to say about eating or not eating meat, Missy, from 1 Timothy. I was married at the tender age of 19. Went straight from home to a new life. And boy! Did it open my eyes. I was also working part time. Was busy with church activities and meetings. Learnt very quickly, had to! And I wouldn’t change a thing. My daughter went to live independently with carer support, but is now back home. When we moved house, my son chose to remain as it was easier for him to get to work. He had to run the house, and do everything himself, and did so very well. He now lives interstate and doing well. Thank you so much Lori! Another encouring and resourceful article ( pluss helpful comments). Do you have any advice in controlling your emotions if you’re a sensitive person. I can get sad sometimes and it doesn’t please my fiancé and I don’t want it to be able to control me anymore because I want my future marriage to be good. I never got spanked as a child and was not very disciplined when I had tantrums. I think it has affected me deeply. Remind yourself that self-pity is satanic. Every time you want to feel sorry for yourself, remind yourself of this fact and shoo those emotions away. Yes, it’s much harder to discipline oneself when one is an adult if the parents didn’t discipline you but it is possible because you have the Holy Spirit living inside of you and you can do all things through Christ who strengthens you. Why is self pity or depression satanic? Self-pity is satanic not depression. It’s satanic because one is only thinking about themselves and their problems instead of focusing their minds on the LORD and things above. Satan loves when we only focus upon ourselves. It causes us to be unfruitful and unproductive for the Lord’s work. I realize that a Hope Chest may contain dishes, and tablecloths, sheets, and blankets, but I think that many future wives would benefit from keeping a “spiritual” hope chest as well. Virtues such as patience, thrift, kindness, self-control,cheerfulness, and good stewardship of resources can go a long way to making a happy, successful marriage. The wedding is just one day in a long life. Romance only sustains a relationship for a few years. What really makes a marriage last is supporting each other and seeking out the best in one’s partner, friends, and family. As a parent, I strive to instill these virtues into all my children so that they will be happy husbands and wives.